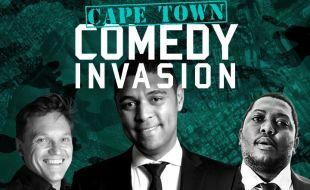 Cape Town Comedy Invasion is coming to Hemingways Casino, featuring Stuart Taylor, Rob van Vuuren & KG Mokgadi. This trio brings you their newest comedy concept. This line-up is a non-stop laughter fest as the comics touch on the silly, the surreal, the naughty & the nice. A favourite of the comedy scene, Stuart Taylor plays host to this motley crew of gag merchants. He is sure to tickle your funny bone with his witticisms. His quick wit and charming stage presence has made him one of SA’s most popular comedians. Comedy stalwart and Cape Town favourite, Rob van Vuuren, is one of the most in-demand comics in SA. He rose to fame as Twakkie as part of the famed comedy duo, “Corne & Twakkie, has starred in numerous local films and is an all-round comic genius. Comedy heavyweight, K Mokgadi headlines the gig. His unique brand of silly and surreal will leave you laughing and pondering in equal measure, but in a good way. The show is sure to give you an authentic taste of the Cape Town funny scene. It’s a BIG show in an INTIMATE space – perfect for a night of comedy that promises loads of belly-laughs.